Plenty of power: The liquid-cooled 675 cc single-cylinder engine has tons of torque and plenty of power. Fuel injection means it starts right up, even on cold days or at high altitude. And the engine is shear-mounted in its own cradle to help reduce vibration. Advanced transmission: The automotive-style automatic transmission uses a heavy-duty torque converter with three hydraulic clutches. It’s tough, with no belts to worry about, and also smart — a two-stage shift map senses when you’re aggressive or light with the throttle, and optimizes power delivery accordingly. Shifting options: Paddle shifters on the steering wheel allow you to override the transmission’s shift points on the fly, or switch to MT mode and use the paddles to shift manually. Fully automatic, automatic with manual override, or fully manual -- you get to choose. Tackle any terrain: Easily shift from 2WD to 4WD. And when you’re in 4WD mode and you need extra traction, just use the lever on the Pioneer’s dash to lock the front differential for extra grip in the toughest situations. Preload adjustability: In addition to a fully independent rear suspension with 230 mm (9.1 in.) of travel, the rear shocks feature preload adjustability to handle the Pioneer 700’s generous load capabilities. Power steering: The Pioneer 700-4 Deluxe’s automotive-style electric power steering lessens steering effort and helps eliminate bump steer, especially over rocks, logs and on sidehills. Tight turning radius: Need to make a tight turn? Tip-toeing through tricky terrain? A short wheelbase and a tight turning radius makes it easy to manoeuvre out of almost any situation. The Pioneer 700-4 has the same length and wheelbase as the two-passenger Pioneer 700. 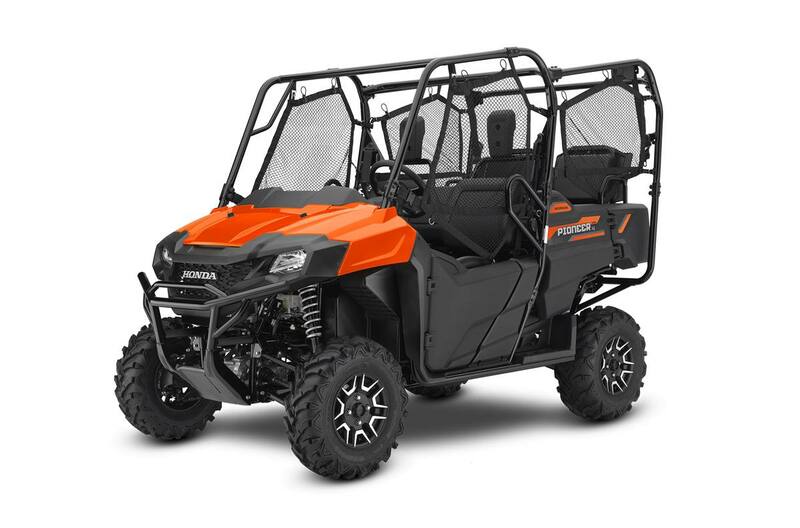 Multiple seating options: The Pioneer 700-4 features innovative QuickFlipTM convertible rear seating that offers the convenience and versatility of switching between two, three or four-person seating, and provides full bed space and tilt function while in two-person mode. Powerful towing capacity: The tilt box with hydraulic-assist strut can hold up to 454 kg (1,000 lb), while the heavy-duty two-inch receiver-style hitch is ready to tow up to 680 kg (1,500 lb). Safe and secure technology: The sturdy Occupant Protection Structure, standard doors with an automotive-style double latching system, roll-up side nets, and three-point belts with an Emergency Locking Retractor mechanism (a speed limiter prevents travel faster than 24 km/h if it detects that a seat belt isn’t being worn), all help keep you and your passengers safe and secure. Excellent visibility: The Pioneer 700-4’s 37.5-watt headlights have excellent balance and light-distribution, eliminating uneven light patterns and dark zones within their illumination area. 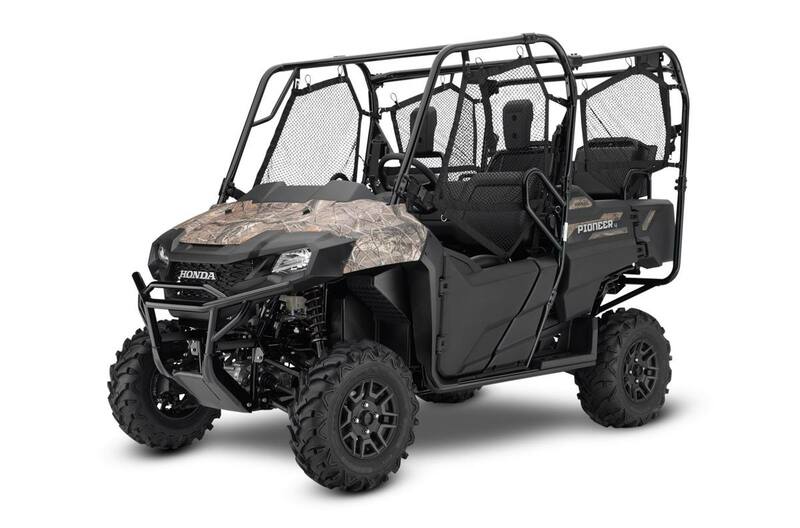 Attention to detail: With well thought-out details like a standard water-resistant glovebox door, digital instrumentation and patented strut system for the folding seats, the Pioneer 700-4 gives you a lot more for your hard-earned dollar. Plus, high-grip floor surfaces and foot holds help to keep you and your passenger stable over rough terrain. The sturdy new front bumper and grille will help keep your Pioneer looking great year after year.